A San Miguel man attempted to kidnap his girlfriend early Thursday morning, but the woman fled with a witness who came to her aid, according to the Paso Robles Police Department. 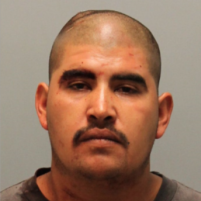 Paso Robles police arrested 26-year-old Jose Ayala Martinez after he crashed his car into a barrier on Highway 46 East, just north of 24th Street. Martinez crashed while pursuing his girlfriend who was fleeing in the witness’s car. Around 12:30 a.m., police responded to a report of a woman screaming from a car in the 1100 block of Black Oak Drive. Martinez had assaulted the woman in a parking lot near the 1300 block of 24th Street, according to a police department news release. A witness saw the assault and Martinez forcing his girlfriend into a car. The woman then escaped the car as it began driving away. The witness, whom Paso Robles police describe as a Good Samaritan, picked up the woman and drove away with her in his car. Martinez then rammed his vehicle into the witness’s car and another vehicle that was passing through the area. But, the witness drove off and Martinez crashed while in pursuit. The crash injured Martinez and disabled his car. Officers found the car and arrested Martinez. They booked him in San Luis Obispo County Jail after he received treatment at a hospital for his injuries. Martinez is charged with assault with a deadly weapon, kidnapping, false imprisonment, spousal abuse and probation violation. He is no longer listed as being in custody, according to the county sheriff’s office website. The victim and multiple witnesses were evaluated at a local hospital and released. Obviously this guy is a complete creep, but why in the world any female would hang with this guy is beyond comprehension. Conversely, some women are “complete creeps” causing one to wonder why any guy would want to “hang” with them. Works both ways. Seems obvious that an upstanding woman wouldn’t want to be associated with the likes of Jose. So, YES, please do wise up, women! Five charges that involve violence and he is out on bail already? What was his bail and how is he out so quickly? His girlfriend and the Good Samaritan are in danger! So did the Sheriff ALLOW this monster to be picked up and deported by ICE? No longer in custody…..just another reason to embrace your second amendment rights. Yet another fine, upstanding citizen of San Miguel. Resident of San Miguel? Perhaps. Citizen of somewhere in Central America? Most likely. Respect for human life? Nada. Needed/wanted in the USA? Nope. I respect that the witness might not want to be identified but I respect the witness even more for his/her actions. I want this person to live as full and as happy a life as can be. As for Martinez, he needs to seek out a speeding bullet and stick hi ugly head in its path. Hmm, this guy sounds like a real catch.